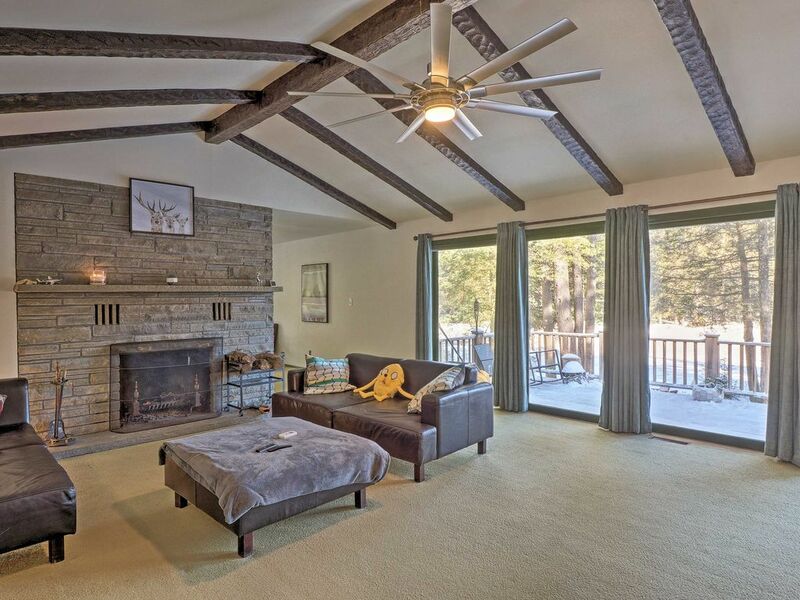 New York’s majestic Catskills await at this 3-bedroom, 2-bath vacation rental home! With 2,000 square feet of living space and 50 private acres, your group of 6 will have plenty of room to spread out and relax. Cozy up in front of the fireplace, roast s’mores over the fire pit, barbecue out on the deck, or head to all the nearby attractions of Monticello or Port Jervis! The Catskills offer endless hiking and mountain biking, while the nearby ski resorts keep the entertainment going come winter! Arrive at this single-story home-away-from-home (with basement), built in the 70s, and take in the surrounding scenery of this semi-secluded property, nestled on 50 acres. Begin each morning sipping coffee from the deck that overlooks your small private lake, and keep an eye out for wildlife! You’re sure to love the peace and quiet this property provides, with minimal to no disturbances. Get lost in a novel or watch shows on the flat-screen TV while you warm up next to the wood-burning fireplace in the living room. If you prefer to stay outdoors, there’s an outdoor fire pit as well! When hunger strikes, head into the fully equipped kitchen to grab a snack or prepare a hearty meal. Dine at the breakfast bar, kitchen table, or dining table. A gas grill is available on the deck should you wish to have a cookout. During the day, the wall of windows streams in natural sunlight, illuminating the interior, and provides exceptional views of the stars at night. For an even better view, step out to the deck or gather around the fire pit to gaze at the constellations. When you’re ready for sleep, 3 bedrooms and the living room sleeper sofa await you. You’re sure to wake up feeling refreshed and ready for the exciting day of adventures ahead. While nestled on 50 private acres in the New York wilderness, this home is still just moments from Monticello to the north and Port Jervis to the south. Drive 15 minutes to Monticello to grab some fresh bread at one of the local bakeries, and stick around the main drag at night for live music. Alternatively, Port Jervis, where you’ll find a charming main street lined with antique shops and micro breweries, is 20 minutes away. New York’s beautiful Catskills offer endless outdoor adventure! Enjoy rafting, canoeing, hiking, mountain biking, and zip lining during the summer, or drive 20 minutes to Holiday Mountain Ski & Fun or 40 minutes to Masthope Mountain for skiing and snowboarding during the winter! Other nearby attractions include the Resorts World Casino, the Monticello Raceway, Monticello Motor Club, Forestburgh Playhouse, and Bethel - home of the Woodstock Music Festival! - Amenities include a fully equipped kitchen, free WiFi, flat-screen TV, fireplace, in-unit laundry machines, linens & towels, central heating, furnished deck with outdoor seating, gas grill, fire pit, wilderness views, 2-car garage, 2-car driveway, private small lake and more! - Secluded Forestburgh location on 40 private acres! Just 15 minutes to Monticello, 20 minutes to Port Jervis, and near a plethora of outdoor adventures within the Catskills! This house is absolutely stunning! Not only is the house beautiful but the property itself is breathtaking. Matt was great and extremely helpful. He’s just a text/phone call away. I literally cannot find one bad thing to say about this house. Thank you for everything Matt, we will definitely be returning!